8:15 PM pick up at your hotel for an overnight train to Lao Cai. On arrival in the early morning, you will be welcomed and transfered to Sapa for breakfast. Then, begin your Sapa tour by visiting local market, where minority people come to exchange things. 14:00 Continue your Sapa tour by visiting Cat Cat village located in a peaceful and beautiful valley. Visit the cottages of Black H 's Mong minority group nearby the terrace rice paldy feild and wonderful waterfall. Back to your hotel. The first day of Sapa tour end. Free in the morning to discover Sapa town. Check out at 12:00. 13:30 Your sapa tour begins by visiting Lao Chai village in beautiful valley of Muong Hoa and nearby is Ta Van village of Dzay and red Dzao ethnic groups. See it, feel it and take it home with wonderful photos. Enjoy totall 4 km of walk in the Kingdom of beauty nature, the best of all Vietnam tours. Arrive in Hanoi at 5:00 AM. Car pick up at Hanoi station. Transfer to your hotel. Sapa tour ends now. Note: Sapa tours' itinerary is subject to change without prior notice. 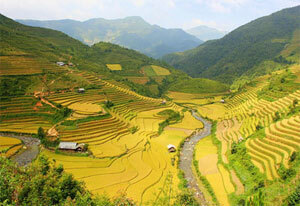 Sapa tour: "Discover Sapa - natural wonder"
Prices quoted in USD nett per person(Tour Code: SP - 03). Note: Vitoria train does not work for both ways(Hanoi - Laocai) on saturday.